Sid (Ted McGuinness, left) explains the ins and outs of drunkenness to Richard (Peter Calvin Atkinson). Top: Atkinson with (from left) Renee Petrofes, Heather Olsen, and Lynn Laurence. Yet it hasn’t been heard from in these parts since a so-so 1998 Lincoln Center revival. Is the large-ish cast off-putting? Or are the travails of the Miller family, of 1906 New London, Conn., considered too mild for these turbulent times? If it’s the latter, the new black-box Ah, Wilderness! at the Sheen Center for Thought & Culture ought to put such fears to rest. Smoothly directed by Peter Dobbins, the piece is as stageworthy as ever, and it works fine in a smaller house. What’s striking about this production is the generation gap: almost to an individual, the younger actors are more impressive than the grown-ups. And that begins with the one thing no Ah, Wilderness! can do without, a terrific Richard Miller (Peter Calvin Atkinson). The closest thing to an O’Neill stand-in, Richard is 16, bright, and headed for Yale, and he feels everything too deeply. Richard hides “dirty” poetry by Wilde and Swinburne from his folks. He’s skeptical about American democracy and intrigued by primitive socialism. And he’s crushed by an apparent break-up with Muriel (a sweet Megan McDevitt), the wholesome girl next door, causing him to get drunk and almost go astray with Belle (Natalie Pavelek, excellent), a hard-living local tart. Atkinson plays utterly in period, keeps the stilted 1906 speech patterns from sounding too rarefied, and exudes teenage anguish like nobody’s business. Even with not a whole lot to play off of when interacting with his parents, Nat (Ken Trammell, competent but stolid) and Essie (Lynn Laurence, bustling unpersuasively and struggling with her lines at a preview), he embodies adolescent angst to the point of making someone well past adolescence recall how it can hurt. He’s a young actor to watch. Richard almost goes astray with Belle (Natalie Pavelek). Photographs by Michael Abrams. So is Heather Olsen, as Richard’s sister Mildred—sassy, curious, ready with an insult, but ultimately a caring sibling. And so is Douglas Wann (Rory Greenfield at some performances) as Tommy, the youngest Miller, an adorable hell-raiser. 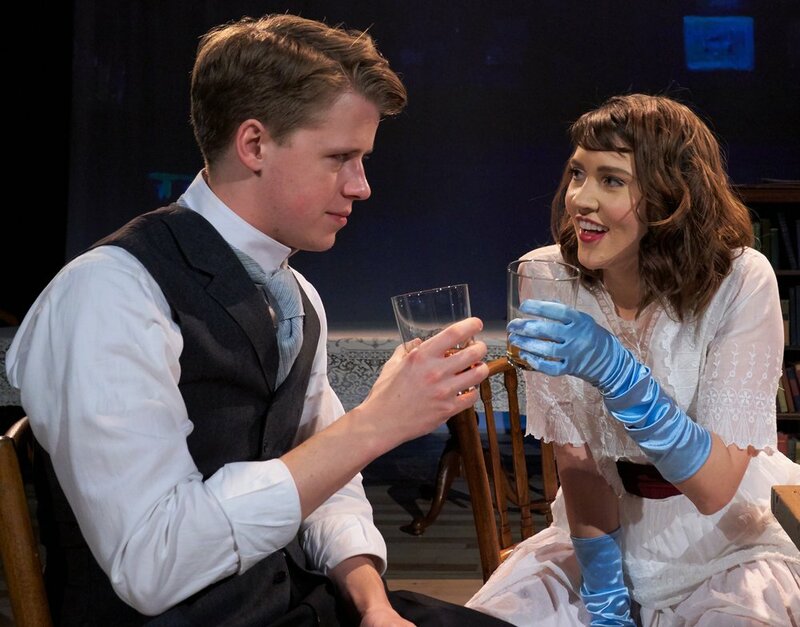 As Arthur, the eldest, a pipe-smoking college man striving to act beyond his years, Sean Cleary hasn’t as much to do as the other siblings, but he does get to sing a couple of turn-of-the-century hits at the piano, as a typical evening’s family entertainment would have gone at the time, and he’s good at that. Marshall Taylor Thurman, double-cast as Richard’s fast-living, troublemaking friend Wint, then as a gruff bartender in the lowdown dive where Richard tries to lose himself, makes a lot out of little. The adults, in comparison, don’t seem to have arrived yet. The other principal plotline involves Sid (Ted McGuinness), Essie’s brother, a glad-handing alcoholic who keeps losing jobs, and his long-going-nowhere courtship of Lily (Renee Petrofes), Nat’s sister, a gentle soul in danger of becoming an old maid. McGuinness’s overplaying and Petrofes’s underplaying ought to balance each other out, but he hasn’t the charm to demonstrate why Sid would be able to talk himself out of the scrapes he lands in, or why the family would tolerate, much less enable, his self-destruction. More than in most productions, this relationship feels unresolved, and Petrofes might do well to study Aline MacMahon, whose Lily in MGM’s 1935 film version (which is, in a word, enchanting) conveys myriad meanings in a look, a walk, a downward glance. Daniel Prosky’s scenic design is functional at best, and Michael Abrams’s lighting does weird things at the end, but Sarah Thea Craig’s costumes are period-accurate, comely, and part of the storytelling: all that heavy fabric on the Fourth of July—how did they stand it? Dobbins keeps the pacing suitably leisurely and lets the piece speak for itself, a fond, hazy O’Neill recollection of people, places, and mores past. The older generation really might work on sharpening their characterizations, and there are probably better productions of Ah, Wilderness! out there, but it’s a pleasure to have this one around. The Blackfriars Repertory Theatre and the Storm Theatre Company production of Ah, Wilderness! runs through Feb. 17 at The Sheen Center for Thought & Culture (18 Bleecker St., between Lafayette St. and the Bowery). Evening performances are at 7:30 p.m. Thursday through Saturday; there is also a matinee at 2 p.m. on Sunday, Feb. 17. To purchase tickets, call the box office at (212) 925-2812 visit ovationtix.com.